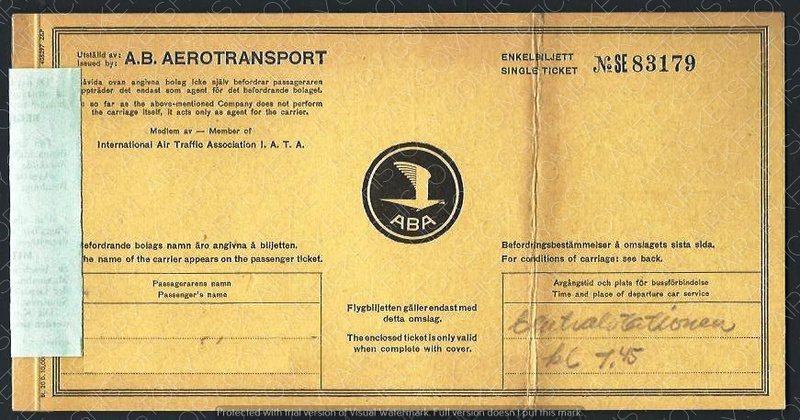 HISTORY: AB AEROTRANSPORT (ABA), was a Swedish airline, was established in 1924 under the name Aktiebolaget Aerotransport. In 1939 ABA started to mark their aircraft with Swedish Air Lines. In June 1948, after a Swedish report, the government-owned ABA and privately owned SILA were merged on a 50-50 basis, to form a new airline named ABA. On October 1, 1950, representatives from the three airlines signed a consortium agreement where they appointed SAS to run the airline operations and the three national airline only to be holding companies.